Redland’s Alex Sexton, playing witth the Gold Coast Suns Reserves last weekend, has won the Round 9 nomination for the NAB NEAFL Rising Star Award (Northern Conference). Shaun Hart chose his words carefully. He didn’t want to put too much pressure on a 17-year-old who had just made his senior NEAFL debut with the Gold Coast Suns Reserves. But as hard as he tried, Hart found it difficult. After all, Alex Sexton is one of not just the most promising young players in Queensland but in Australia. He was such a standout in his first outing for the Suns Reserves against Southport last Saturday that he was named fourth best in a side that included 21 listed players, including nine who have played at the elite level this year. So good, too, that he won the Round 9 nomination for the NAB NEAFL Rising Star Award (Northern Conference). Sexton, doing Year 12 at Chisholm Catholic College, Cornubia, joined Queensland U18 teammate Adam Oxley as top-up players in the Suns’ 36-point win over the Sharks at Surfers Paradise. A supplementary list player at Redland this year after signing with the Bombers during the off-season for geographic reasons, he was the first player nominated for the Rising Star Award from the Suns camp. He joins a nomination list which includes Redland teammate Trent Manzone, NT Thunder’s Jed Anderson and Ross Tangatalum, Broadbeach’s Kallen Geary and Luke Shreeve, Aspley’s Michael Hutchinson, Mt.Gravatt’s Nathan Reid and Brisbane Lions top-up player Richard Newell, and is tipped to be a hot contender for the overall Rising Star award. Hart, Brisbane Lions triple premiership player turned Suns Reserves coach, quite understandably spilled over with enthusiasm when discussing Sexton’s talent and potential. “He (Sexton) has got so much to offer … he was in our best six on the weekend and for a player his size his ability to stay in the line of the contested footy was really outstanding,” he said. Hart said Sexton, used off the interchange bench in a midfield/forward rotation, did well as an inside and outside player and had “about 20 possessions” in addition to kicking a goal. But there were two possessions which stuck in the mind of the ever-courageous ex-Lions midfielder. “There was one time in defence he won the footy in between two big-bodied Southport players – and from where I saw it one of the Southport players jumped off the line while he (Sexton) kept coming at it,” said Hart. “He won the footy and put it down the throat of (teammate) Jack Stanlake. Sexton, who played one top-up game with the Brisbane Lions Reserves last year and trained with the Suns over the off-season, had a decided advantage over a lot of top-up players in that he at least knew most of the players he played with on Saturday. But still it was a big step up for the talented youngster, who moved from Reservoir in Melbourne to Brisbane with his family in 2008 and played at senior level as a 16-year-old last year with Springwood in the Pineapple Hotel Cup. “It was good to catch-up with a few guys again,” he said, modestly rating his debut performance as “not too bad”. Sexton’s Rising Star nomination was another entry in a 2011 football diary that shapes as something pretty special. He’s already toured Europe in April with the AIS/AFL Academy squad in which he described as “the best trip ever”. The highlight, he said, was two-fold – beating VFL club Geelong at the MCG before heading overseas, and visiting the headquarters of world soccer heavyweights A.C.Milan. “That was crazy… just to see all the money they have and what they do with it,” he said. Touring with fellow Queenslanders Sam Michael and Brian Coleman-Broome and the best young prospects in the country, Sexton also visited Gallipoli for the Anzac Day service, spent time in Italy with three-time world cycling champion Michael Rogers and played a match in London against a European Legion team. Now he’s focused solely on what shapes as a key role with the Australia Post Queensland Scorpions at the NAB Australian U18 Championships, starting with their Round 1 match against South Australia at Blacktown Olympic Stadium in Sydney this weekend. 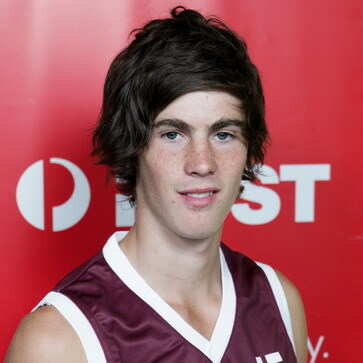 It is a happy hunting ground for Sexton, who won the Alan McLean Medal as the division two B&F and the Queensland MVP at the 2010 NAB Australian U16 Championships. It’s all leading up to the 2011 NAB AFL Draft, when he will be eligible to be claimed by the Suns as a Queensland Zone selection, or, if passed over by them, will go into the draft pool. But Sexton is being careful not to get too far ahead of himself.